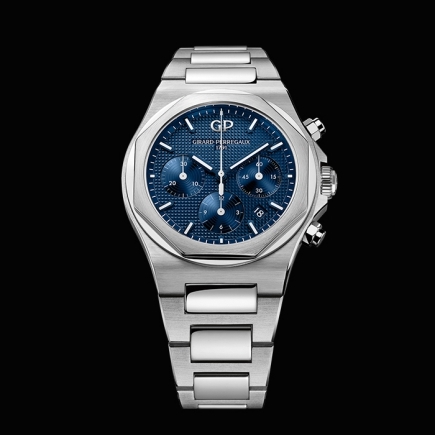 girard perregaux | 361'000 € Tax inc. 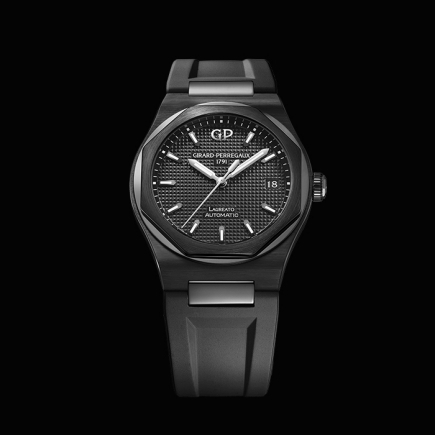 Deeply attached to its origins and to watchmaking traditions since 1791, Girard-Perregaux regularly shows in its watch creations to what extent innovation can contribute to the dynamism of the watch industry. 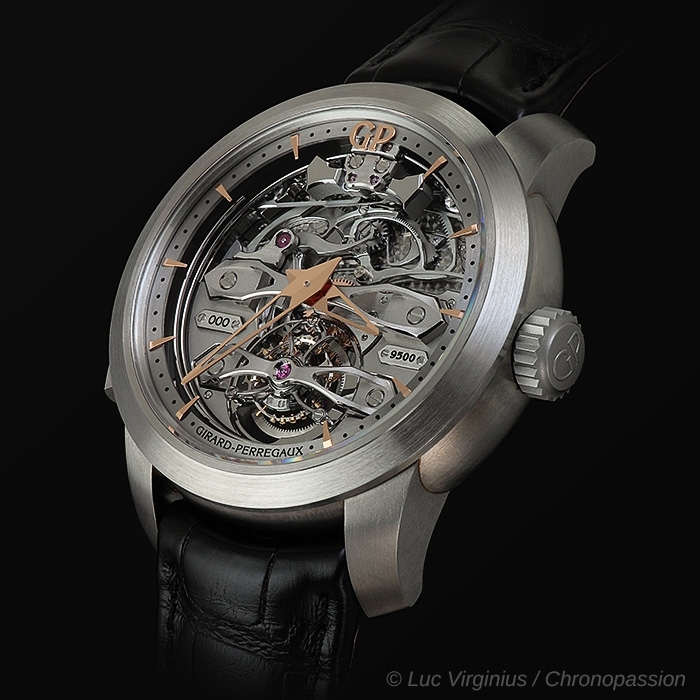 By giving a totally new dimension to the mechanical structure of the striking mechanism, the Minute Repeater Tourbillon with Titanium Bridges watch underlines the Swiss Manufacture's constant determination to advance technically while respecting the aesthetic conventions and time-honored expertise that are so close to its heart. 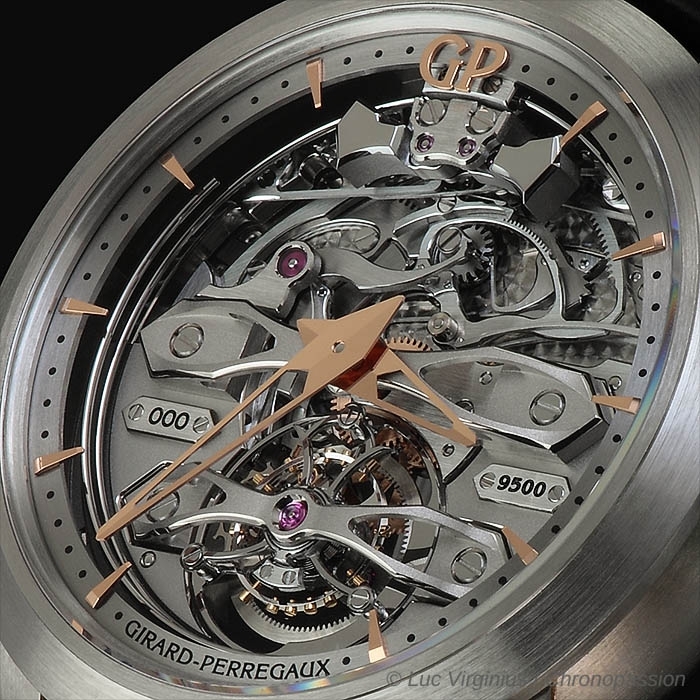 The mechanical structure of this Minute Repeater Tourbillon with Titanium Bridges offers an original opportunity to simultaneously observe on the dial side both the components of the striking-mechanism and the hammers that produce its sound by striking the wires of the gongs. 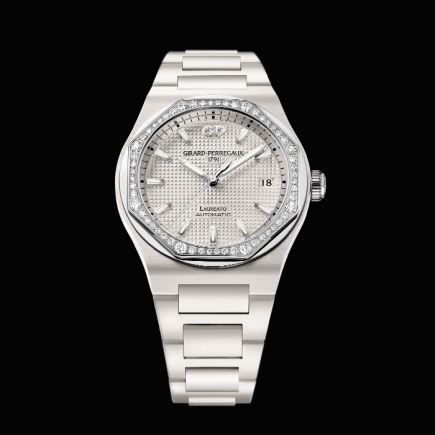 In a major innovation, this positioning of the components facilitates optimum sound transmission when the watch is on the wearer's wrist. This underlines a desire not only to create a mechanism that is as attractive as it is efficient, but also to place it clearly on display for the enjoyment of one and all. 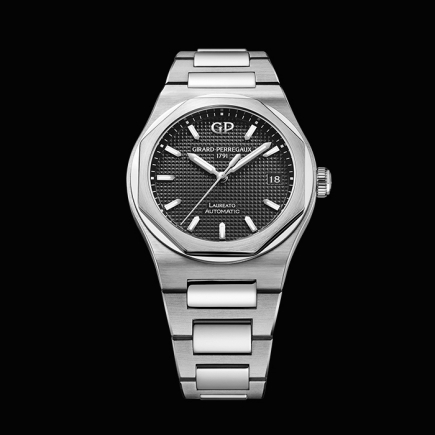 Girard-Perregaux took the ambitious decision of asking its teams of watchmakers and engineers to create a brand new type of caliber with a totally original mechanical structure that makes the invisible visible. 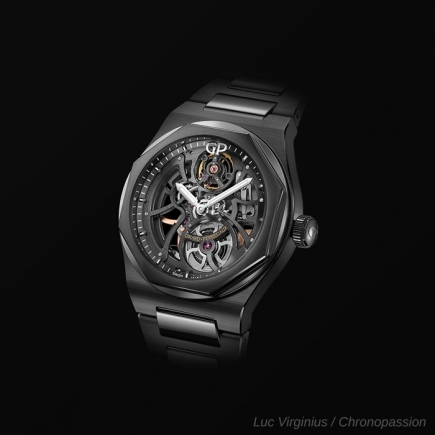 Underlying this approach is an implicit desire to perpetuate the Firm's expertise and watchmaking tradition, embodied by the Tourbillon with Titanium Bridges also found in this model. 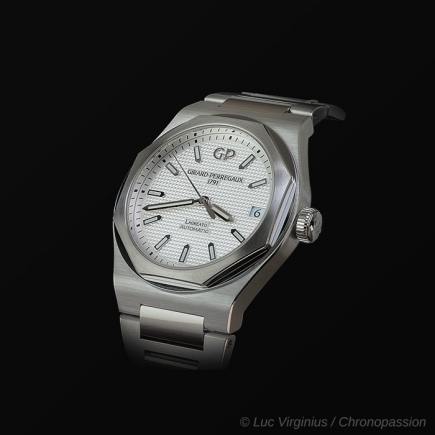 This emblem of the Girard-Perregaux brand, the design of which was patented in 1884, is today perceived as the aesthetic, technical and even symbolic essence of one of the most venerable Swiss watch manufactures still in existence. 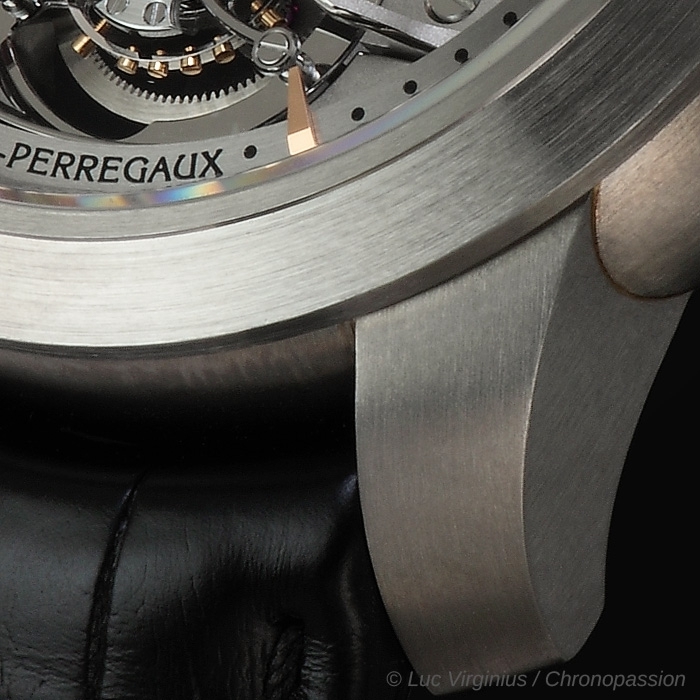 How to produce a strong, clear sound from a wristwatch equipped with a minute repeater mechanism only too often continues to be a stumbling-block for many watchmakers. Scores, if not hundreds, of different solutions have been proposed in order to perceptibly improve the volume of sound produced by these timepieces, the principle of which first emerged at the turn of the 17th century. 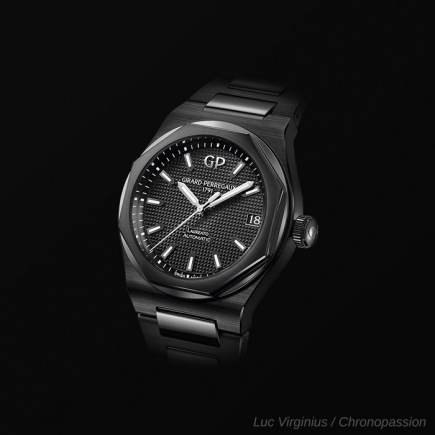 However, Girard-Perregaux purposely chose not to implement any of the previously existing solutions. None of these succeeds in both beguiling the ear by diffusing a powerful melody and delighting the eye by giving the wearer the opportunity to observe the components of the striking-mechanism during the course of their movements. 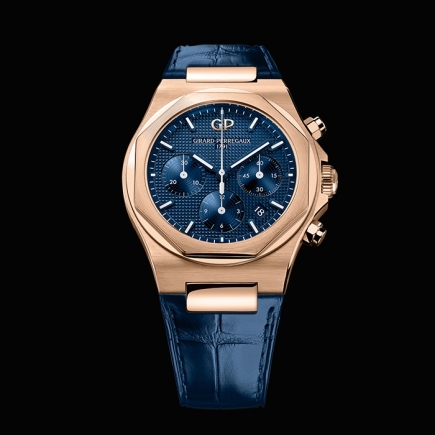 With its desire to infuse a spirit of creativity into the notoriously tradition-bound world of watch complications, the Girard-Perregaux Manufacture proposes a classic watch that displays on its front side not only a Tourbillon with Titanium Bridges, but also, still on the same side, the majority of the components that enable the minute repeater complication to produce a strong, clear sound, even when in position on the wrist. 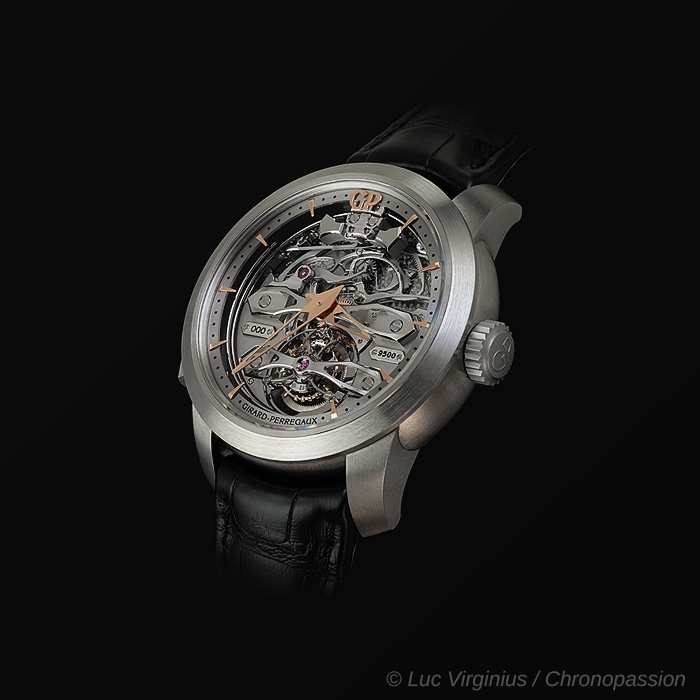 To achieve such a result, the watchmakers were obliged to re-design not only the entire manual caliber, but also its method of construction and operation. 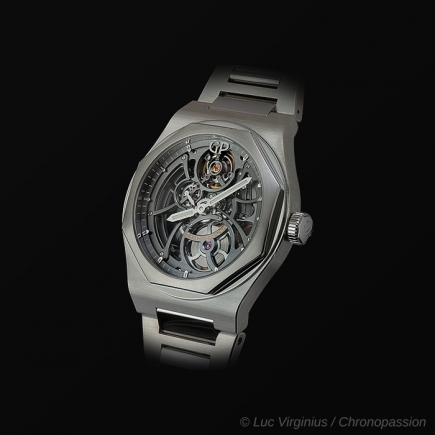 It is the highly unusual structure of the striking-mechanism, together with the adoption of a number of subtle technical solutions for this complication that has allowed the Minute Repeater Tourbillon with Titanium Bridges to perform so exceptionally well. Thus, in order to enhance the transmission of the sound wave between the heels of the two gongs, the link between the main plate and the Titanium case-band has been stiffened. This is not all, however. To increase the speed of the hammers and consequently their striking impact, they are each mounted on a pair of jewels acting as ball-bearings so as to reduce friction. The design of this structure has such a harmonious visual impact that it may seem simple. However things that look easy are in fact often exceedingly complex to achieve. 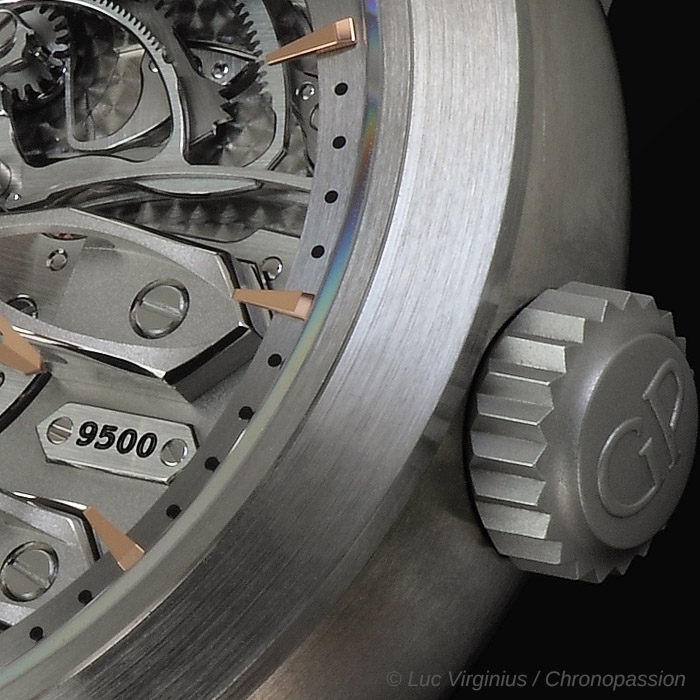 No fewer than 270 hours of painstaking labour by a master watchmaker are required to assemble and adjust this magnificent mechanism. 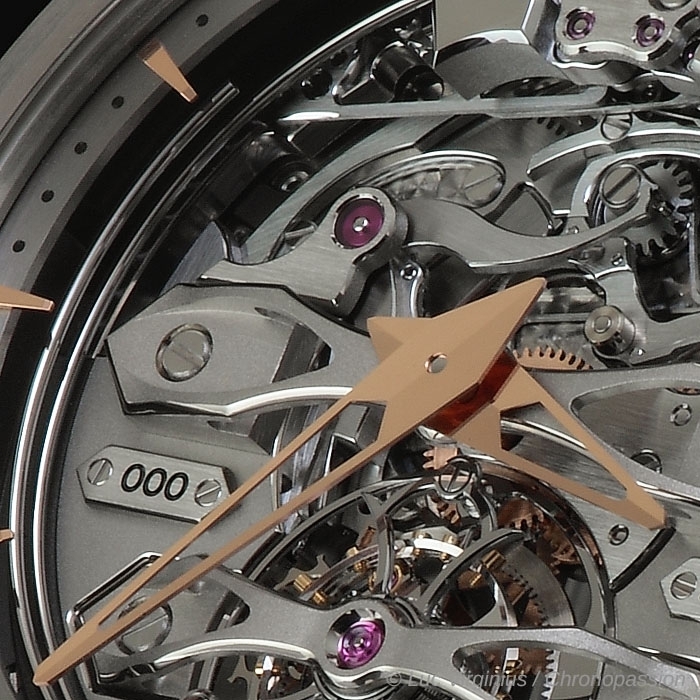 This work is made all the more arduous by the fact that the method of production of the minute repeater complication, with its hammers placed on the same plane as the racks used to wind them up prior to striking, makes it necessary to adjust the hammers outside the movement using a special tool simulating their future position. 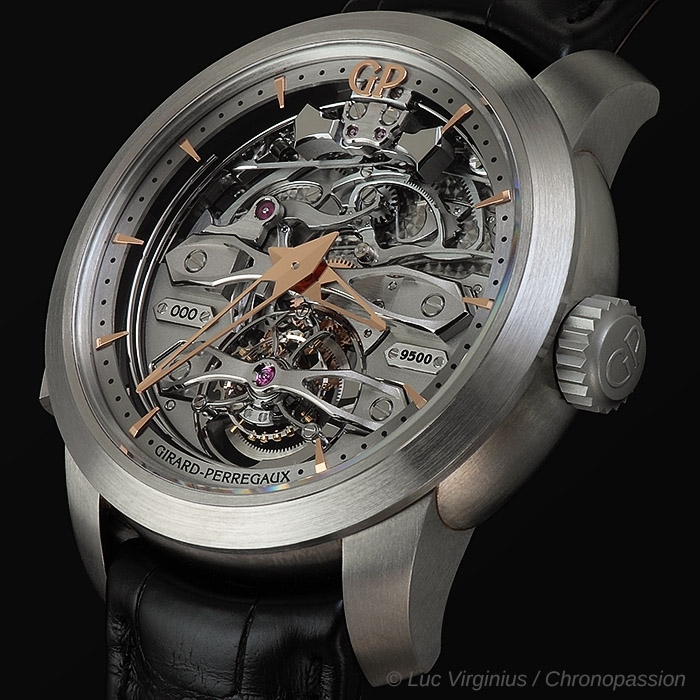 Nevertheless the final result is there for all to see, and these small components made from black polished tempered steel and beveled to highlight their original design inspired by the watch's three titanium bridges, produce thanks to their high degree of inertia a clear, powerful note at each strike. 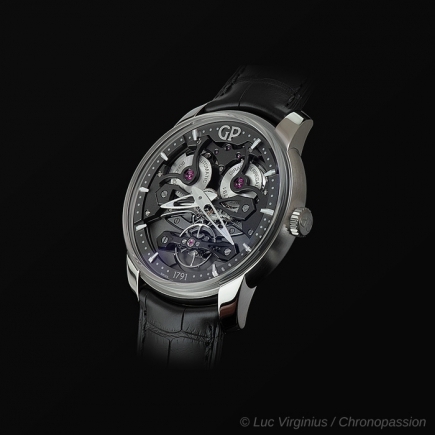 To house this exceptional mechanism, Girard-Perregaux has chosen a round case with a domed case-band prolonged by the slender lugs that are characteristic of models in the Haute Horlogerie collections. 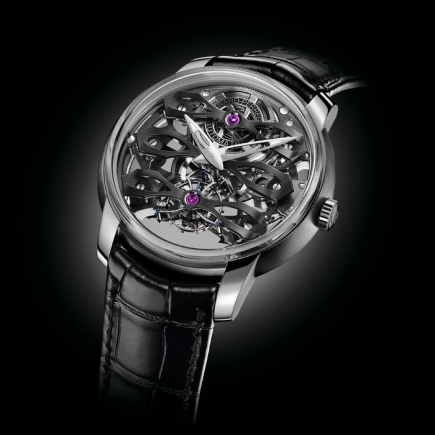 Its gently inclined bezel allows for a wide opening out over the movement and facilitates the captivating spectacle of the minute repeater mechanism, of the hammers, gongs and Tourbillon. 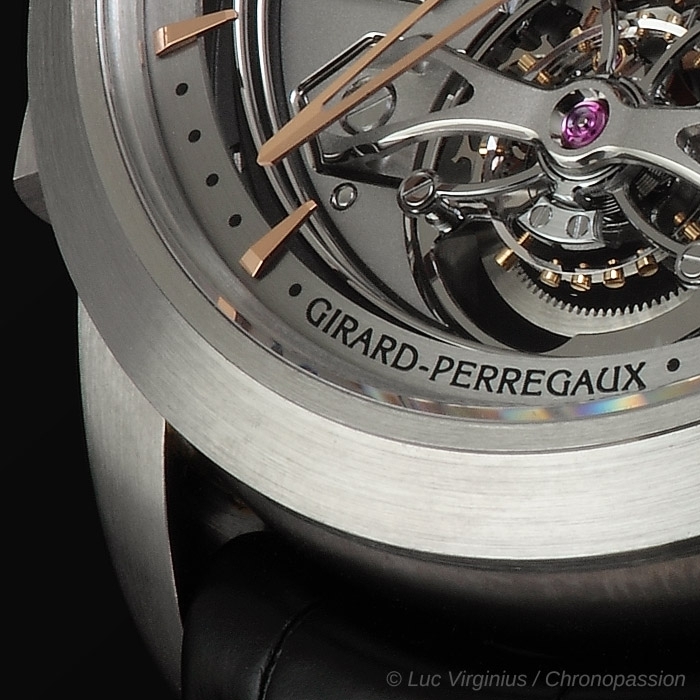 The emblematic arrow-shaped Titanium Girard-Perregaux Bridges and marking-plates identify the pedigree of this mechanism, with its irreproachable finishes, crafted in accordance with the long traditions of the Manufacture. 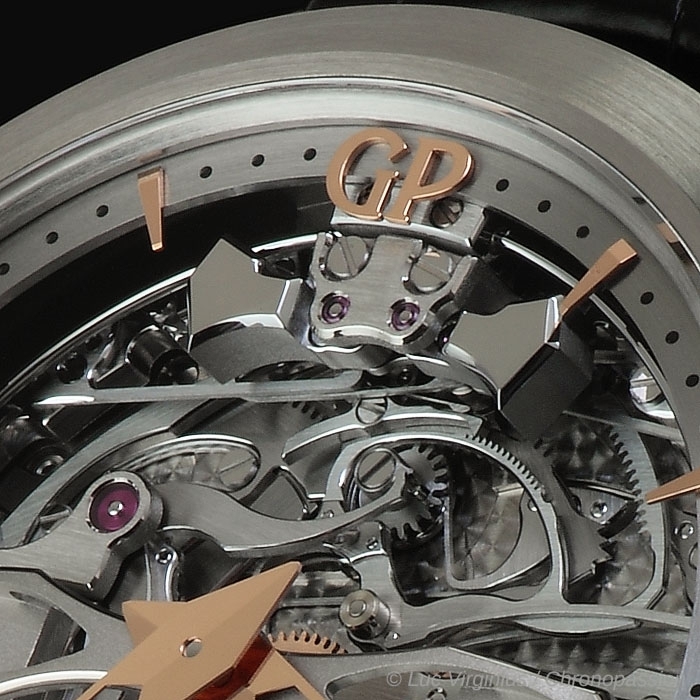 The caliber is also revealed on the case-back side with a third Titanium Bridge and the Girard-Perregaux logo engraved on the main plate. 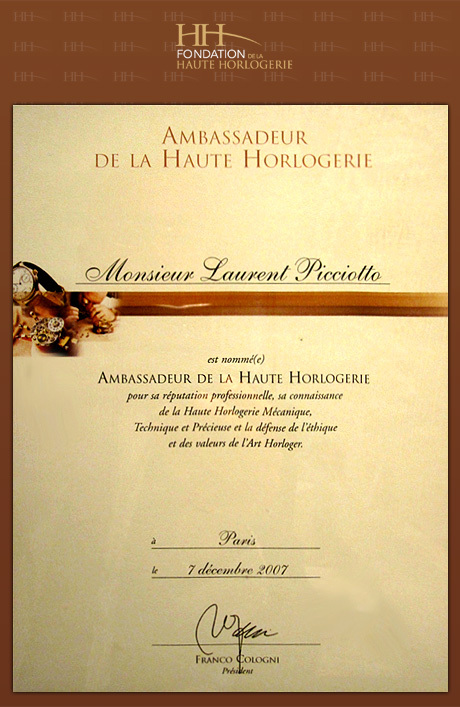 All the components of the movement are manufactured by hand according to the criteria of the Haute Horlogerie.